Pylypets, motel "Meeting at the Lion"
Ski resort in Pylypets, hotel "Meeting at the Lion" offers you comfortable stay in a three-storey wooden cottage on the bank of the mountain river. There is a sauna, restaurant with delicious homemade dishes. Pylypets, mini-hotel "Meeting at the Lion"
A english text is not available. Please read a full description of the hotel in Ukranian or Russian. 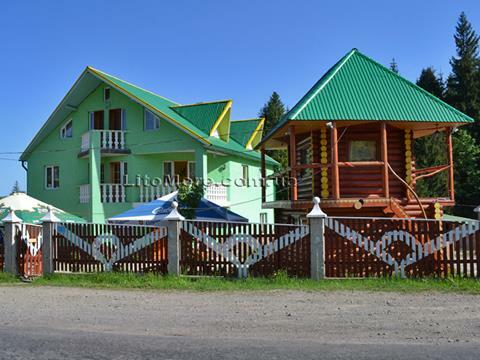 Ski resort Pylypets is located among picturesque mountains of Borzhava valley. Hotel "Meeting at the Lion" is located near the road from Volovets to Mizhhiria at the entrance to Pylypets village. Mini-hotel "Meeting at the Lion" is situated on the bank of the mountain river with clear and crystal water; it is not far from fir forest. Hotel "Meeting at the Lion" is a three-storey cottage with 8 comfortable rooms and a wooden house intended for 3 rooms. This complex contains a restaurant, Russian baths with a steam room and a swimming pool in the mountain river. Hotel "Meeting at the Lion" has its own parking for cars and buses, convenient access to its territory. There is a tent city on the territory of the hotel and across the river there is a camping with parking place for cars, motorcycles, ATVs. Pylypets is the second highest ski resort of Ukraine after Dragobrat resort and tracks of various levels of difficulty, so that is why lovers of winter sports come here in winter season. One of the seven lifts with length of 750 m is a few hundred meters away from the hotel. Near the hotel you can rent skis, sleds, snowboards, in summer you can rent mountain bikes as well. If come during the Christmas holidays, hospitable owners will offer you an exciting program of celebrating New Year's Day and Christmas in compliance with national traditions. In summer you can gather mushrooms and berries in this wonderful corner of wilderness, without fear of their environmental safety. One of the most famous natural tourist sites of Zakarpattia Shypit waterfall is in Pylypets; and in five kilometers in Kelechyn village there are springs of unique mineral water, they are relative to the springs in Kyslovodsk. Water from the springs in Kelechyn is recommended to use with iron deficiency anemia and in diseases of the digestive organs. The owners of "Meeting at the Lion" motel can arrange tours to the most remote natural wonders: Lake Synevyr, Narcissus Valley and hot springs of Kosyno. The owners of "Meeting at the Lion" hotel of Pylypets resort offer comfortable rooms «Standard» class. Rooms are furnished with wooden furniture (singe or double beds, wardrobe, table, chairs etc. ), all rooms have TV (satellite TV), bathroom with a shower. Cold and hot water is 24 hours. Price for accommodation in Pylypets at "Meeting at the Lion" hotel are the following: in summer is 150 UAH per person per night, in winter is 180 UAH per night (price includes two meals). The restaurant of "Meeting at the Lion" hotel in Pylypets is served traditional European and Zakarpattia cuisines. Visitors appreciate the facility for real homemade quality food, large selection of well-known wines and liqueurs of Zakarpattia, unique flavor of tea with mountain herbs. Mini-hotel "Meeting at the Lion"
Hotel "Meeting at the Lion" welcomes you to spent unforgettable rest in the Carpathians!